A few years ago, I purchased a foreclosed home and it seems that on some areas water was leaking from the roof onto the tiles and they have stained. I've tried scrubbing with bleach and other household ingredients and have managed to remove some of the calcium deposits, but the stain is still there. I would like some recommendations on how to salvage them. If it is calcium carbonate, "lime", then there are numerous commercial products to remove it. Some products are specifically suggested for use on tile. If you want to try home remedies, start with distilled vinegar, which is comparatively safe for construction materials and for people. The strongest chemicals, such as hydrochloric acid (muriatic acid, HCl), are corrosive, have toxic fumes and are likely to damage grout and wood, if not ceramic tile itself. 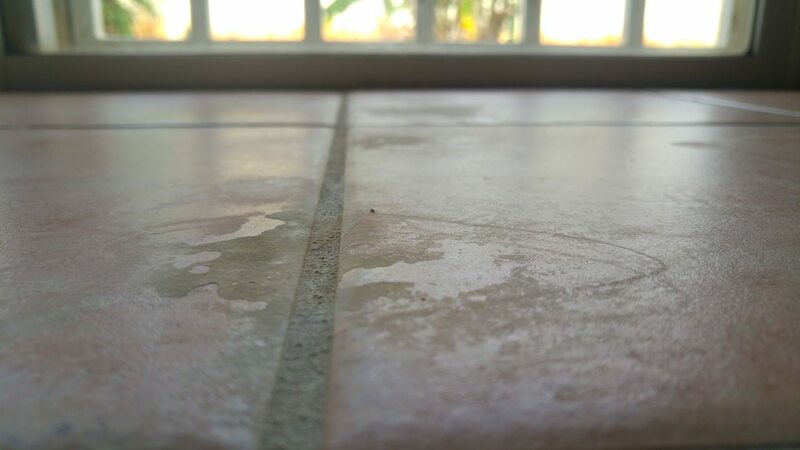 After cleaning, be sure to seal the tile to improve appearance and to make further damage less likely. N.B. Links are to show examples of commercial products, but are not recommendations. Not the answer you're looking for? Browse other questions tagged flooring tile cleaning ceramic-tile or ask your own question. How do I finish my partially finished floor? How can I get my shower tiles really clean? How can I remove paint stains from a bathtub? How do I get rid of mold from the bottom of a bath mat (where the suction cups are)?